It might be difficult to imagine now with the snowy landscape and biting cold but we are predicting this situation will eventually change. To nudge the process along we have decided it’s time to announce this years SEC-T Spring Pub Event, without which, as we know, spring cannot arrive. This year we are again trying a new venue in the hope of eventually find the perfect place to host this lovely annual event. 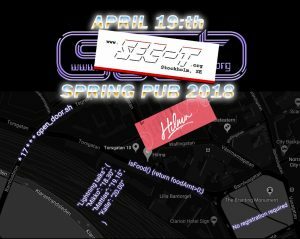 This year we have decided to host the spring pub at Hilma on Torsgatan 10 by Norra Bantorget. If you are interested in giving a lightning talk or have other ideas you would like to share please send us an email to [email protected] and we will sort it out. This event is free and requires no pre-registration.